This past December, the USAG Stuttgart Garrison Commander established a policy regarding the wearing of uniforms off-post. The purpose of the policy is to set one standard and reduce confusion resulting from several recent policies regarding the do’s and don’ts of off-post uniform wear. The policy was formulated with input from a panel of antiterrorism officers from the Stuttgart military community, then staffed and approved. The policy can be summarized by stating that the wearing of uniforms off-post is only allowed while traveling in vehicles to and from work, during lunch and on ruck marches. Some of the key points follow. Personnel within the USAG Stuttgart area of responsibility, whether permanent party or on TDY, will wear civilian clothing while using commercial transportation such as aircraft, trains or buses. This is to limit exposure to potential threats while using public transportation. Large groups of uniformed military personnel on public transportation create lucrative targets. Personnel traveling via military contract transportation, such as the duty buses that run between installations, will wear the duty uniform of the day. Service members picking up personnel from the airport will wear civilian clothes. Public transportation hubs such as train stations and airports are commonly targeted by terrorist groups. Most arrival areas are in unsecured areas, making them likely targets for active shooters and IEDs. Service members in uniform are not authorized to wait in off-installation establishments such as hotel lobbies, or wait curbside, while awaiting transportation. Uniforms will not be worn when traveling by foot or bicycle to and from U.S. installations. Pedestrians and cyclists are easy to identify and easier to target for an intentional traffic accident or kidnapping. Uniforms, when not worn, will be carried in an inconspicuous manner, out of plain sight. Service members are not authorized to wear miscellaneous uniform items while participating in Family and MWR, USO or unit-sponsored outdoor activities. However, if wearing miscellaneous items while on their own or with their family, it is authorized. The intent is to limit a military signature during these types of activities or trips. Members of the high school Junior Reserve Officer Training Corps program will comply with the same uniform standards as service members. The similarity of uniforms could make them a target for someone looking to harm Defense Department personnel. At Protection Condition Bravo, uniforms may be worn to off-post restaurants during lunch or the shift equivalent, during duty hours. Generally, physical training uniforms are not authorized off-post, however, foot marches off-post with military equipment is authorized. While it is possible to elicit a training response in a different PT uniform, it is not possible to familiarize and condition the body to evoke a training response for specific military equipment, such as body armor and rucksacks without actually wearing the equipment. 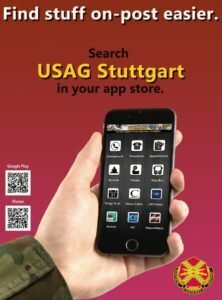 These are the guidelines established by the USAG Stuttgart Commander, and they affect all Department of Defense service members in the USAG Stuttgart area of responsibility, regardless of rank, unit, service component or time in the area. Commanders may establish and enforce more stringent requirements on personnel within their organizations as appropriate to the threat and circumstances, as they deem necessary. Although at times this policy will be difficult and inconvenient, adhering to it will make the DOD community safer by reducing the target population presented to a terrorist threat.